MODENA, 27/02/2019 – The ECHO project (European network of Cybersecurity centres and competence Hub for innovation and Operations) is one of four Pilot projects, launched by the European Commission, to establish and operate a Cybersecurity Competence Network. Amid keynote presentations from supporting representatives of EU agencies and industry, the project was officially launched at the Conference Hall of the Royal Military Academy of Belgium, on February 25th, 2019. Ongoing evolution, improvement and adaptation of project outcomes throughout 2022. To make the ECHO vision a concrete reality in Europe, ECHO comprises 30 partners from 15 EU member countries plus Ukraine, representing 13 existing cybersecurity competence centres and comprised of five research institutes in the cybesecurity domain; eleven large enterprises; four SME’s; and ten top level universities in cybersecurity including experts in human factors, experts in legal and ethical issues and communication. Zanasi & Partners (Z&P) is a research and advisory company in the field of security and defence based in Modena. Its expertise includes big data analytics, cyber-security/cyber-defence, social media monitoring, threat, vulnerability and risk assessment. 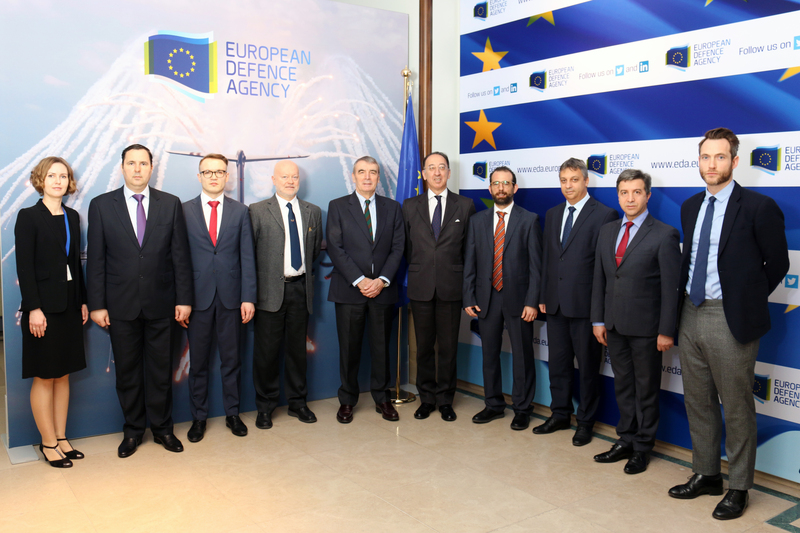 Among its clients, Z&P counts European Commission, ESA, ENISA, FRONTEX, CIRA, Siemens, GEDI Gruppo Editoriale, Booz&Co, as well as several ministries and government agencies falling under European countries and the MENA region. Zanasi & Partners’ President, Mr. Alessandro ZANASI, will participate as keynote speaker to the “1st European Conference on EU Funding for Defence and Security Projects“, which will take place in Berlin, Germany, on the next 27th and 28th September. Organised by the European Academy for Taxes, Economics & Law, the event will gather representatives from the EEAS, the defence industry as well as from various European Ministries of Defence (Bulgaria, Estonia, Greece, Finland), with the aim of discussing the new possibilities and the new challenges related to the European Union’s financing of defence and security actions. The official brochure of the event can be downloaded here. Zanasi & Partners officially supports HackIstanbul 2018, an international cyber security event which will take place in Istanbul, Turkey, in September 2018, within the context of the Teknofest event. HackIstanbul 2018 CTF (Capture the Flag) contest will gather thousands of hackers from 132 countries worldwide to exhibit their skills. Hackers’ skills will be pushed to the limits by advanced real life cyber-attack scenarios prepared under the guidance of world’s foremost experts. The deadline to register for the contest is September 6th. Hackers who succeed in the preselection stage on September 7th, will gain access to enter the CTF challenge on September 9th. Every stage with different levels of difficulty and complexity will push the hackers to the limits while raising the excitement of the contest to the highest level. 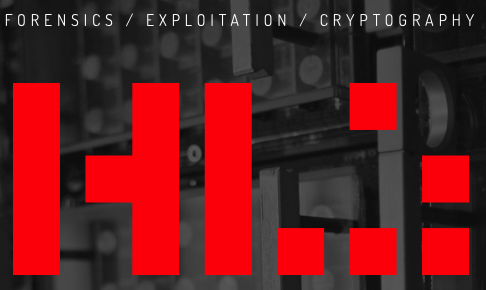 Hackers who reach September 9th will face 6th preselection challenge; the 18 hour CTF challenge will carry only the best hackers to the final round. The top 10 teams who succeed the CTF will be invited to Istanbul for the grand final stage that will be hosted at world’s one of the biggest airports IGA – Istanbul Grand Airport on September 22nd. The hackers will test their skills on the Anti Drone Command&Control Center Cyber Security Test System under development by ASELSAN. The winning team will be awarded 15,000USD grand prize, while the 2nd best team will be awarded 10,000USD and the 3rd team will be awarded 5,000USD. The winners will get their prizes from The President of The Republic of Turkey Recep Tayyip Erdoğan. In addition, the participants who best performed during the event will receive a job offer from Zanasi & Partners. Download the flyer of the event: here. On the 25th-27thJune 2018, Zanasi & Partners participated to a showcase of the BODEGA project, organised during the SDW Conference and Exhibition 2018. Hosted at the Queen Elizabeth II (QEII) Centre, a major conference venue located at the heart of London, the event provided the BODEGA consortium with the opportunity to present project results to stakeholders from government and industry as well as from the side of travellers. Zanasi & Partners played a key role in organising the event. 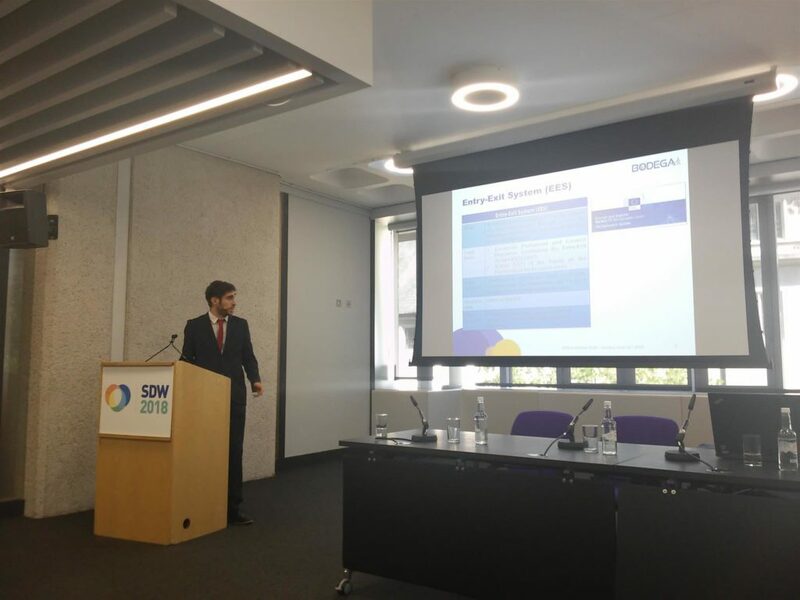 Mr. Alessandro BONZIO, who represented the company at the SDW 2018, chaired a series of public seminar sessions dedicated to BODEGA. 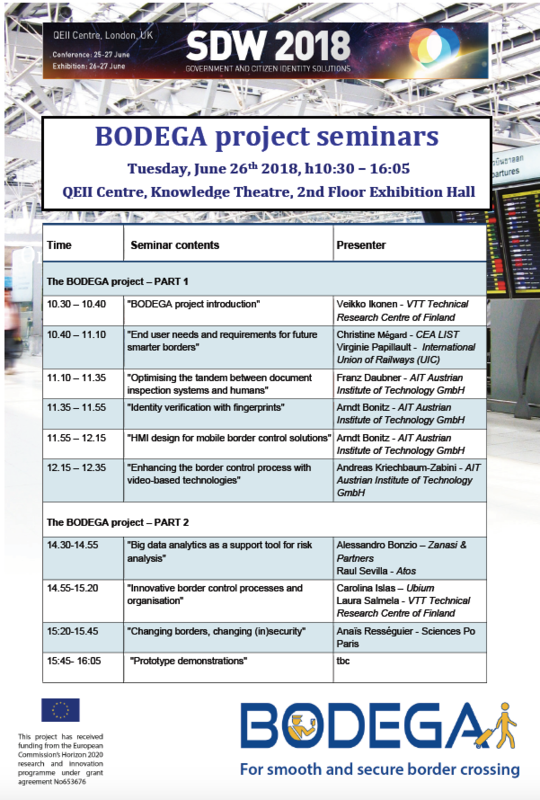 During one of the seminars, he presented the findings of BODEGA’s research into data-driven risk analysis at EU borders, exploring the potential of big data analytics techniques in supporting early detection of high-risk travellers. In addition to the public seminars, the BODEGA project was presented within a session of the SDW Conference themed “Intelligence and Innovation at the Border” as well as at BODEGA’s own exhibition stand available throughout the SDW 2018. BODEGA is a research project funded by the European Commission’s under the Horizon 2020 programme, which started in June 2015 and is scheduled to end in September 2018. The aim of the project is to develop an expertise about human factors and border crossing at European level, in order to enhance the efficiency of border control procedures with no negative side effects towards the end-users, both travellers and border guards. Besides BODEGA, Z&P is currently involved in also another research project in the border control domain, called TRESSPASS, which kicked-off in Athens in early June 2018. MODENA, 25/06/2018 – In the face of an increasing number of travellers, migration flows and terrorist threats exert an unprecedented pressure on the European authorities in charge of border control activities. The TRESSPASS project, through which Europe aims to ease this scenario, started in Athens on the last June 8th, run by a consortium that includes Zanasi & Partners, an Italian research and advisory company specialised in the fields of security and defence. The aim of TRESSPASS, funded by the European Commission through the programme Horizon 2020, is to develop an innovative model for the EU border management based on the real-time risk assessment of travellers, with the goal of increasing the border security of Member States. The proposed approach is focused on the assessment of the risk posed by individual travellers by using dedicated risk indicators, whose value can be calculated through the use of technologies and processes developed by the partners of the project. Depending on the estimated risk level, it will be possible to adapt the intensity of the controls to which each traveller will be subject. This measure will enable authorities to maintain the desired security level and reduce the operational costs without undermining trust and satisfaction of travellers. Crucial to the implementation of this model will be the development and integration of enabling technologies – from web intelligence systems and behavioural analysis to identification and monitoring techniques for people and baggage – activities that will however occur within a rigid framework of ethical and legal nature. Training of border patrol to the use of Open Source Intelligence techniques (OSINT). Active in Europe, Middle East and North Africa, Zanasi & Partners has also a broad expertise in big data analytics, cyber-security/cyber-defence, social media monitoring, risk assessment and strategic use of technologies. The TRESSPASS project, which will last 42 months and have an overall budget of around 8 million euro, is coordinated by the National Centre of Scientific Research “Demokritos”, an important Greek multidisciplinary research centre. Amongst the other members of the consortium, composed of 22 organisations from 10 different European countries, there are multinational and small specialised companies, as well as universities and research institutes, port and airport operators and border authorities of EU Member States. MODENA, 25/06/2018 – Flussi migratori e minaccia terroristica, a fronte di un numero sempre maggiore di viaggiatori, esercitano una pressione senza precedenti sulle autorità adibite ai controlli di frontiera. 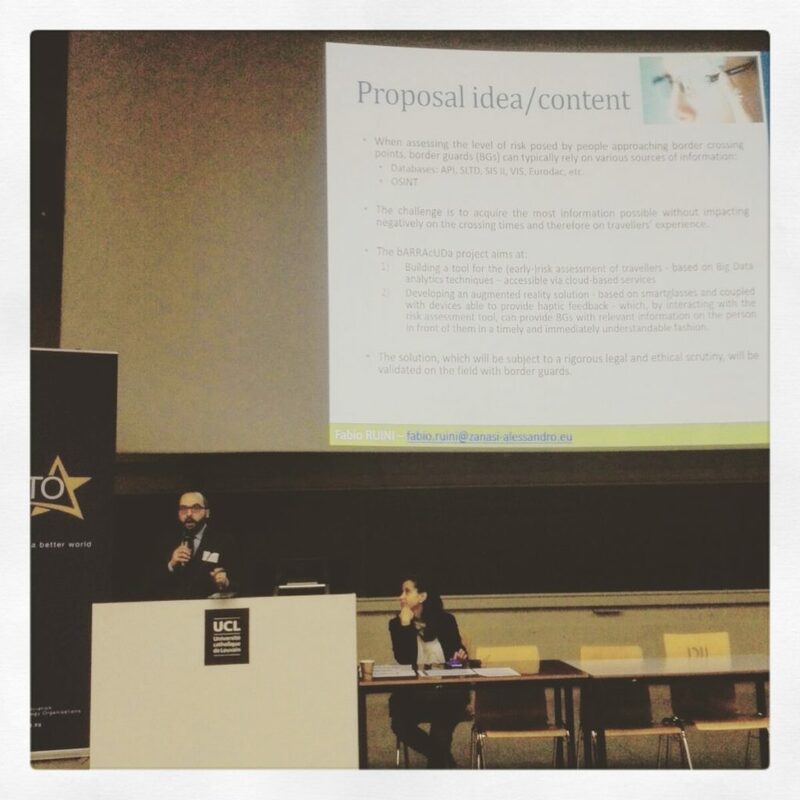 Il progetto TRESSPASS, con cui l’Europa si propone di fronteggiare questo scenario, ha preso il via ad Atene lo scorso 8 giugno da un consorzio di cui fa parte Zanasi & Partners, società italiana di ricerca e consulenza in materia di sicurezza e difesa. L’obiettivo di TRESSPASS, finanziato dalla Commissione Europea tramite il programma Horizon 2020, è quello di sviluppare un modello innovativo per la gestione dei confini UE, basato sulla valutazione del rischio, al fine di rendere più sicure le frontiere dei Stati Membri. L’approccio proposto è incentrato sulla valutazione del rischio rappresentato dai singoli viaggiatori utilizzando appositi indicatori di rischio, il cui valore viene calcolato tramite il ricorso a tecnologie e processi sviluppati dai partner del progetto. A seconda del livello di rischio stimato, sarà possibile adattare l’intensità dei controlli a cui ciascun viaggiatore sarà sottoposto, affinché le autorità possano mantenere il livello di sicurezza desiderato e ridurre i propri costi operativi senza minare fiducia e soddisfazione dei viaggiatori. Fondamentale per la messa in pratica di tale modello sarà lo sviluppo e l’integrazione di tecnologie abilitanti – da sistemi di web intelligence e analisi comportamentale a tecniche di individuazione e monitoraggio di persone e bagagli – attività che avverranno tuttavia entro un rigida cornice di carattere etico e legale. Addestramento delle guardie di frontiera all’utilizzo di tecniche di Open Source Intelligence (OSINT). Attiva in Europa, Medio Oriente e Nord Africa, Zanasi & Partners vanta competenze anche in materia di big data analytics, cyber-security/cyber-defence, social media monitoring, risk assessment ed uso strategico delle tecnologie. A guidare il progetto TRESSPASS, che avrà una durata di 42 mesi e beneficerà di un budget complessivo di circa 8 milioni, è il National Centre of Scientific Research “Demokritos”, centro di ricerca multidisciplinare greco. Tra gli altri membri del consorzio, composto da 22 organizzazioni provenienti da 10 paesi europei, vi sono società multinazionali e piccole aziende specializzate, università e istituti di ricerca, operatori portuali ed aeroportuali e autorità di frontiera di Stati Membri dell’UE. Zanasi & Partners (Z&P) è una società di ricerca e consulenza in materia di sicurezza e difesa di sede a Modena. Tra le proprie competenze: big data analytics, cyber-security/cyber-defence, social media monitoring, threat, vulnerability e risk assessment. Z&P annovera tra i suoi clienti: Commissione Europea, ESA, ENISA, FRONTEX, CIRA, Siemens, GEDI Gruppo Editoriale, Booz&Co, oltre a diversi ministeri ed agenzie governative facenti capo a Paesi europei, mediorientali e nordafricani. MODENA, 05/06/2018 – The FINSEC(Integrated Framework for Predictive and Collaborative Security of Financial Infrastructures) research project – funded by the European Commission under the Horizon 2020 programme, and aimed at improving cybersecurity in the financial sector– has been officially launched in Brussels. Banks and financial institutions have always been among the most attractive targets for malicious and criminal organisations. The advent of the Internet further exacerbated this phenomenon, extending it to an ever-greater dimension, with 1.06 million of cyber-attacks detected in 2016 against the banking sector alone. The trend has further expanded in the last two years, which have seen a boom of cyber-attacks against the computer networks used by banks and financial institutions, as well as the SWIFT infrastructure, ATMs and POS. As pointed out by Europol’s Director, Rob Wainwright, the increasing sophistication of cyber-attacks “can threatenthe survival of several critical infrastructures, namely those linked to the financial and banking sector”. This scenario – the collapse of the economic backbone of any European country– would have devastating consequences, preventing citizens and companies from having access to their current accounts or making electronic payments. An example of that was set in the last few days, when the failure occurred in the VISA electronic network impeded millions of transactions. The FINSEC research project comes within this context, aiming at developing a framework security architectureto provide financial stakeholders with an integrated management (both physical and cyber) of security. Such architecture will enable a quick reaction to attacks, promoting at the same time the collaboration between different stakeholders in evaluating and mitigating the risk over the entire financial supply chain. FINSEC, which is coordinated by GFT Italia, involves 22 organisations from 9 European countries, including leading actors in the IT (Atos, IBM, Fujitsu, HP), as well as in the banking and financial sectors (Liberbank, Istituto Centrale della Banche Popolari, SIA, HDI). Amongst the Italian members of the consortium, a key role is played by Zanasi & Partners, a SME based in Modena, that over the years has managed to carve out a leading role in the field of European security and defence research. The FINSEC project, which has been funded with 8 million euro by the European Commission, also envisages a return for the involved organisations. One of the goals consists in fact in the development of amarketplace for security services, which is an IT platform to be used by the organisations who develop innovative cybersecurity solutions under the FINSEC project to sell them – in the form of services – to banking and financial organisations. MODENA, 05/06/2018 – Avviato a Bruxelles il progetto di ricerca FINSEC(Integrated Framework for Predictive and Collaborative Security of Financial Infrastructures), finanziato dalla Commissione Europea nell’ambito del programma Horizon 2020 e dedicato al tema della cybersecurity nel settore finanziario. Banche ed istituzioni finanziarie costituiscono da sempre bersagli tra i più appetibili per singoli ed organizzazioni criminali. L’avvento di Internet ha ulteriormente esacerbato tale fenomeno, estendendolo ad una dimensione mai rilevata fino ad oggi, con 1.06 milioni di attacchi informatici rivolti al settore bancario nel solo 2016. Nell’ultimo biennio il trend si è confermato in espansione, con un vero e proprio boom di cyberattacchi contro le reti informatiche su cui poggiano gli istituti bancari e finanziari, contro l’infrastruttura SWIFT che gestisce le transazioni interbancarie, ATM (i tradizionali “sportelli Bancomat”) e POS (ovvero i terminali per i pagamenti via carte elettroniche). Come sottolineato dal direttore di Europol, Rob Wainwright, l’aumento nel livello di sofisticazione dei cyberattacchi “è in grado di minacciare la sopravvivenza stessa di diverse infrastrutture critiche, sicuramente quelle dei settori finanziario e bancario”. Tale scenario, ilcollasso della backboneeconomica di un Paese europeo, renderebbe impossibile l’accesso ai conti correnti e l’utilizzo di strumenti di pagamento elettronico da parte di cittadini ed imprese, con conseguenze devastanti. Un piccolo esempio ci è stato fornito proprio nei giorni scorsi, con il malfunzionamento verificatosi nella rete telematica di VISA, che ha impedito milioni di transazioni. Il progetto di ricerca FINSEC interviene in questo contesto, ponendosi l’obiettivo di sviluppare un’architettura di riferimento per la sicurezza, che ne permetta agli attori del mondo finanziario la gestione integrata (sia fisica che cyber). Tale architettura renderà possibile reagire tempestivamente agli attacchi, promuovendo al tempo stesso la collaborazione tra diversi stakeholder nel valutare e mitigare il rischio nell’ambito dell’intera financial supply chain. FINSEC, coordinato da GFT Italia, vede la partecipazione di 22 organizzazioni provenienti da 9 Paesi europei, tra cui leader dell’informatica (Atos, IBM, Fujitsu, HP) e dei settori bancario e finanziario (Liberbank, Istituto Centrale della Banche Popolari, SIA, HDI). Tra i partner italiani che fanno parte del consorzioun ruolo chiave è ricoperto da Zanasi & Partners, PMI con sede a Modena, che negli anni si è affermata quale importante attore nel settore della ricerca europea in materia di sicurezza e difesa. Il progetto FINSEC, che ha ricevuto un finanziamento di 8 milioni di euro dalla Commissione Europea, prevede anche un ritorno economico per le organizzazioni coinvolte. Uno degli obiettivi è infatti quello di sviluppare un marketplace per servizi di sicurezza, ovvero una piattaforma IT attraverso la quale leorganizzazioni che nell’ambito di FINSEC hanno sviluppato innovative soluzioni di cybersecurity potranno commercializzarle, sotto forma di servizi, alle organizzazioni del mondo bancario e finanziario interessate.